A campaign by the HIV Prevention Justice Alliance for the US Centres for Disease Control and Prevention (CDC) to confront criminalisation in the United States is finally bearing fruit. The HIV Prevention Justice Alliance is network of organisations advocating for effective and just HIV prevention policies for the United States, coordinated by Community HIV/AIDS Mobilization Project (CHAMP) in collaboration with AIDS Foundation of Chicago, and SisterLove. Their campaign began in 2008. The Alliance was extremely concerned that prosecutions for HIV-associated spitting and biting were doing a lot of harm. CDC has long maintained that contact with saliva, tears, or sweat does not expose others to an appreciable risk of HIV transmission. The continued perpetuation of false information by the justice system and the media on how the virus is transmitted underscores the need for more effective HIV communication and education strategies at the highest levels that are accessible to the general public. In light of an unabated and growing HIV epidemic among certain segments of the U.S. population, we believe that it is incumbent upon the CDC to aggressively respond and provide the public with the most accurate information to reduce HIV vulnerability. A December 2008 letter from the CDC had previously pledged to do all of what they now promise to do (see below), but when no action was taken, the Alliance sent another letter in January 2010 to the CDC's Kevin Fenton – Director of the National Center for HIV/AIDS, Viral Hepatitis, STD and TB Prevention – "to urge CDC to take action on the steps it had identified to address the criminalization of HIV." Update and expand the "Rumors, Myths, and Hoaxes" section of the CDC website by April 30th 2010. Update and expand CDC's factsheet and question and answer sets (Q&As) regarding HIV transmission to better address myths and misconceptions about HIV transmission by April 30th 2010. 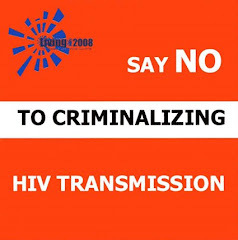 Develop internal talking points to ensure CDC staff is equipped to deliver consistent, scientifically accurate information when they receive inquiries around issues of criminalization and/or myths and misconceptions about HIV transmission by April 30th 2010. Survey health departments, beginining May 2010 to determine whether they have collaborative relationships with criminal justice personnel and, if so, how these relationships affect HIV prevention efforts in communities. Use information obtained from the surveys to develop a communications package to provide to state and local health departments with the tools and messages they need to facilitate interactions with their criminal justice counterparts by August 30, 2010. The letter concludes: "While these activities represent a concrete beginning, we realize there is much to be done to address the need for a public health, rather than punitive perspective to drive how people living with HIV/AIDS are approached in the United States. We all must continue to be forward thinking in this endeavor, and collectively we will make a broader impact. We at CDC appreciate the work organizations such as yours do in the communities affected by this disease." I'd like to congratulate all those involved in persuading the CDC to take its first tiny steps towards making a stand against the draconian treatment of people living with HIV in the United States. Their response is focused on the most egregious criminal prosecutions, and there is, indeed, "much to be done to address the need for a public health, rather than punitive perspective to drive how people living with HIV/AIDS are approached in the United States." For example, the CDC could also publically state that non-disclosure laws do more harm than good for public health, and also support the idea (which they already are exploring on a population level) that on an individual level people on successful antiretroviral treatment are as as unlikely to expose their sexual partners to HIV as those who wear condoms. Click on the image of Mr Fenton's pledge to read the entire letter.